Naval communications and their communicators have always been held in high regard. Operating and maintaining sophisticated electronics equipment is difficult enough on solid ground, but doing it on the ocean with winds and waves tossing the platform (ship) relentlessly can exacerbate the problem tremendously. It is a wonder that radar systems can even be useful with the antenna constantly rotating about pitch, roll, and yaw axes while simultaneously shifting in the x, y and z axes. Sure, airborne platforms have the same sort of challenge, but their perturbations are not typically as violent, as great in magnitude, or as prolonged as a naval vessel in rough seas. For the record, I'm a former USAF radar guy so I'm not just trying to glorify my own branch of service. This article from Radio & Television news gives some insight into the life a naval communicator during the 1950s. Born Reno, Nevada in 1898. Graduated from U. S. Naval Academy in 1918. Promoted to Lieutenant (jg) during World War I, advanced to rank of Captain in 1942, became a Rear Admiral in 1944. He took a post graduate course in radio engineering at Annapolis and subsequently served in various communications posts in many different theaters. From October 1942 until March 1945 he served as communications officer and assistant chief of staff for communications on the staff of fleet Admiral Chester W. Nimitz. He commanded the USS Massachusetts until 1946 after which he assumed command of the Naval Receiving Station at Treasure Island. He became Deputy Commander and Chief of Staff to the Commander Western Sea Frontier in 1947 and later served as Deputy Commander Western Sea frontier and Deputy Commander Pacific Reserve Fleet. In July 1949 he reported to the Chief Naval Operations for duty as, Director, Naval Communications, a post that he continues to hold at the present. He has been decorated 9 times. Fifty years ago Marconi installed the first wireless equipment on Navy ships. Today, utilizing all forms of communications, naval forces, whether on land, sea, or in the air, are united as a single fighting unit. On a gray morning in 1803, Commodore Edward Preble set sail with a "task force" of wooden ships to instill respect for the infant United States in the pirates of the Barbary Coast. Preble's communications consisted of a strip of bunting, a megaphone, and a bull voice. Naval Communications have come a long way since those pioneer days. 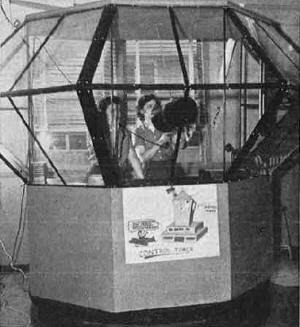 Early progress was primarily in the extension and perfection of visual communications systems. By 1875, the Navy was experimenting with electricity for signaling. There was much excitement the following year when signals were read at a distance of 6 miles by means of an electromagnetic device. The flash lamp, perfected in 1878, permitted signals to be read at the unheard-of distance of nearly 17 miles! Communicators of the day hailed the event with enthusiasm. But it was the advent of "wireless" that gave Naval Communications its real impetus. With the Nineteenth Century approaching its close, Guglielmo Marconi startled the world by his experiments with wireless. He was invited to experiment under Navy supervision. As early as 1900 the young inventor and his assistants were installing the "Marconi device" aboard several vessels. In 1901 the Navy made its first wireless installation on a battleship. A year later the first Naval wireless test stations on shore were established at Annapolis, Maryland and Washington, D. C. During 1903, five different systems of wireless were under test in the United States. By the end of that year, the Navy's tests had progressed to the extent that seven ships and five shore stations were fully equipped with wireless apparatus and operators were furnished for service use. Wireless had shed its swaddling clothes and was growing rapidly. The Navy now demanded that the new equipment be installed on all its fighting ships. Meanwhile, developments ashore kept pace with those at sea. Six experimental stations were built. A special training school was established at the Brooklyn Navy Yard. Wireless - or radio, as it came to be called - was in the Navy to stay. From then on, advance followed advance, keeping pace with technological progress, lessons learned from operational experience, and the needs of the Navy. The present-day Naval Communication Service would stagger the imagination of communicators of the early 1900's. All known forms of communication are employed. Today's naval vessels are floating communications centers - from the tiny torpedo boat with as few as seven radio circuits to the mighty carrier with more than a hundred. The extensive, yet flexible circuits of the Naval Communication Service keep the fleet units of a seven-seas Navy in constant communication with each other and with the Naval Shore establishment. Through careful planning, an organization has been built up that can get in touch with any ship in the fleet almost instantly. With the facilities now available, a ship out of sight is never a ship out of mind. No longer does the control of communications by shore stations extend only as far as the eye can see through a telescope. Today, distance does not limit communications, for messages can be sent around the world. The Naval Communication Service (NCS) has three watchwords - "Reliability, Security, and Speed." The performance of each element of the myriad services - and devices which make up the overall NCS is weighed in terms of those three factors. As the name implies, Naval Communications is a "Service." Its mission is to provide and maintain reliable and secure communications, based on war requirements, adequate to meet the needs of the Operating Forces, the Navy Department, and the Naval Shore Establishment, primarily to serve command and secondarily to facilitate administration. 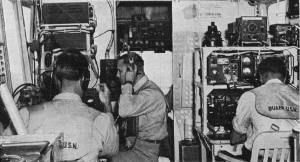 A Navy radioman operates teletype equipment. These units are now being used extensively by the Navy. A private network of such teletype stations links far-flung stations and ships. In considering command, a parallel is found in the game of football. The quarterback on a football team is, in effect, the "officer in command." When he directs a play, he is exercising a function of command, and each signal he calls is a command communication. The information he passes on is the most important his team can receive, for it determines just which course of action will be taken against the opposition. Naval Command, playing a role similar to that of the quarterback, controls the movements of the operating forces. Command cannot function smoothly without reliable and rapid means of sending and receiving information - and no Naval operation can be successful without the smooth functioning of Command. Thus it is that the first duty of the Naval Communication Service is to serve Command. All Navy dispatches do not relate directly to combat, even in wartime. Most communications deal with activities that support the fleet. It is a big task to equip and train all the personnel in the Navy and to provide for them such vital needs as ammunition, transportation, food, clothing, hospitals, and supply depots. In moving the countless messages that must be handled to carry on the work of supporting the fighting forces, Naval Communications facilitates Administration. To maintain the objectives of "Reliability, Security, and Speed," flexibility is a necessity. In the development of Naval Communications, it has been found that no one method of passing information can adequately serve all purposes at all times. Scientific progress has added immeasurably to the effectiveness of communications, but it has not eliminated the utility, under certain conditions, of some of the earliest methods of signaling. The systems of communications employed today in Naval Communications embrace many new, some old, methods. They run the gamut from hand semaphore to the advanced radioteletype, and include visual communications, sound, wire systems, radiotelegraph, radiotelephone, facsimile-radio-photo, television, and even messengers. Messenger communication, as the name implies, provides delivery by hand from the communication office of the originator to that of the addressee. The courier who carried news of victory from Marathon to Athens was a forerunner of today's messenger. When other methods, especially radio channels, are overloaded, messengers do much to relieve the congestion. Like messenger service, mail is an important alternate method for easing the transmission load on wire and radio circuits. It should be noted that the Navy Postal Service is an integral part of the Naval Communication Service. Naval Communications has responsibility for the establishment and operation of Navy post offices, both afloat and ashore. 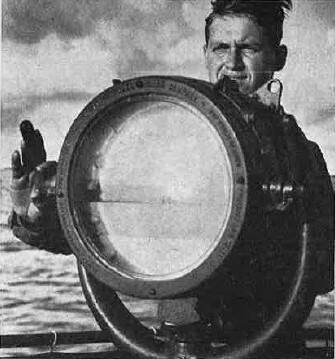 Visual signals are still widely used in the Navy. The transmission of intelligence by visual methods is ancient in origin. Yet, today visual communication still holds its own along with more modern systems. 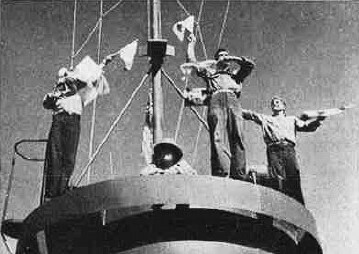 The three principal types of visual signaling - flaghoist, semaphore, and flashing light - meet the rigid demands of good naval communications. Flaghoist signaling, because it can be used to reach a complete group of ships rapidly and simultaneously, is about the most efficient type of visual short-range communications. Almost all flaghoists are coded signals. To communicate by flaghoist, the originator selects the combination of flags that will convey his particular message. The flags are then attached to the halyard which carries them to a yardarm to form a display - a complete flaghoist message. The receiving station reads the meaning and takes appropriate action. More than 60 flags and pennants go into action at one time or another. It is an inspiring sight, to any observer, to see a large convoy of ships traveling in close formation, maneuvering in unison to displays of multi-colored flags. 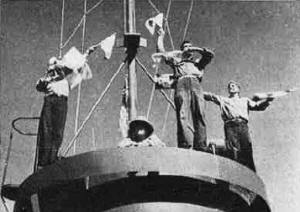 Semaphore is another fast, short-range form of signaling. It requires the most simple equipment of standard visual methods, just two flags attached to staffs. 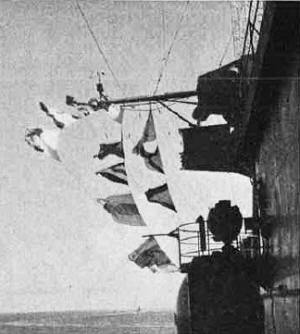 Being restricted to short-distance communication, Semaphore is more secure than either radio or light, since there is less chance of interception. The third principal visual signaling method is flashing light. It is a visual telegraphic system using International Morse Code, the same code used by radiotelegraph operators. The signalman sends and receives dot-and-dash characters as short or long flashes of light. There are two systems of flashing light, directional and non-directional. In directional signaling, the light is aimed at the ship or station to which the message is being sent. Searchlights, blinker tube, or a multi-purpose signal lamp are used for this purpose. Non-directional signaling is accomplished by yardarm blinkers. These are a cluster of special non-directional electric lamps, located near the ends of the yardarm. Additional devices used in visual communications are pyrotechnics and panels. Pyrotechnics are merely fireworks of various types with special meanings assigned to each type or combination. The meanings may change, but usually deal with distress or emergency identification. Another kind of pyrotechnic is the smoke grenade, used to mark locations in the water. Panels are strips of material laid out on the ground to give instructions and information to aircraft. The position of the panels in relation to one another determines the meaning of the message. Sound in communication is employed in underwater signaling devices. These devices can be used over short distances to communicate with submarines or surface vessels that carry similar echo-ranging equipment. Messages are sent by telegraph key. Underwater sound transmissions are slow, the range extremely limited, and security from interception poor. Reliability of communication is subject to variations in the temperature of the water, the salt content, the depth, and other conditions that affect the movement of underwater sound waves. Wire communication systems employed by the Navy include cables, landwire telegraph, telephone, and teletype. The Naval Communication Service does not own or operate cables. Therefore, when such facilities are required, the cables of commercial companies or foreign governments must be utilized. Landwire telegraph - the sending of Morse Code over wire - is now almost completely replaced by the faster and more efficient teletype. The telephone, being convenient and speedy, is, of course, especially suitable for administrative traffic at naval bases and shore stations. The most widely used wire system for communication between stations ashore is teletype. The teletypewriter, broadly speaking, is little more than an electrically operated typewriter. Teletype may be defined as "typewriting at a distance." It is the most rapid and accurate system of recorded wire communication. Normal speed of transmission is in the vicinity of 60 words-per-minute, but much higher speeds are possible. By operating a keyboard similar to that of a typewriter, signals are produced that print characters in page form. or on a tape. These characters appear at both the sending and receiving stations. One teletypewriter transmitting signals will actuate all receiving machines connected to the teletype system. For example, an operator transmitting from New York to Boston has his message repeated, letter by letter, in Boston as soon as it is formed in New York. The same occurs at all receiving stations tied into the network. One form of teletype operation is called "simplex." This provides transmission in a single direction at a time. Simultaneous flow of traffic in both directions is provided by a second method, "duplex." By employing separate wires, carrying incoming and outgoing signals, duplex can carry nearly twice as much traffic as simplex. Special transmission devices, known as tape relay equipment, enable messages to be relayed from one point to another with a minimum of delay. A combination of transmitter-distributor, perforator, and printer gives the operator the choice of messages printed on a page, perforated on tape, or both. An incoming message may be received in page form for the record, and punched on tape by the perforator at the same time. The tape can be used for further relay by feeding it into the appropriate circuit transmitter-distributor. Diagram of how a plane. carrying "airborne early warning" radar equipment is used to relay this information over the horizon. Prior to 1940, Naval Communications within the continental limits of the United States consisted of point-to-point radio circuits and one landline Morse telegraph circuit. Messages which could not be handled by the Navy's facilities were routed via commercial communication companies. 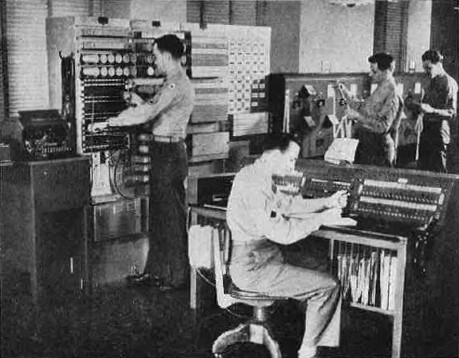 In July 1940, a commercial teletypewriter network was developed to serve selected Naval activities. This became known as the TWX System. The Navy was charged at toll call rates, so much for the first three minutes, and additional charges for overtime. As the volume of messages increased, the cost of communication soared. It became mandatory in the interests of economy that a private teletypewriter service be installed for the Navy, to supplement TWX, and to serve activities which were handling large numbers of messages. 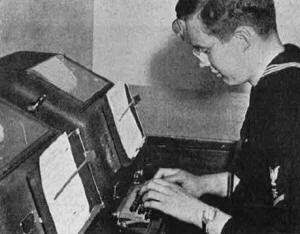 In May 1941, the first private Navy teletypewriter circuit was inaugurated between Washington and New London. This became the nucleus of the present extensive U. S. Naval Teletypewriter System, which is commonly called the NTX System. Primary relay stations are located in five communication centers, at Washington, San Francisco, Honolulu, Guam, and Balboa. The various Naval Districts tie into these primary stations either by landwire or by radioteletype. Each continental Naval District has a major relay station and is connected to Washington or San Francisco by direct wire circuits. Western districts channel traffic to San Francisco, eastern districts to Washington. San Francisco and Washington are connected by landline teletype. Ships at sea and major relay stations outside the continental limits feed into the primary stations by radioteletype. To provide complete NTX coverage, minor and tributary stations are set up at activities within Naval Districts and at outside points, when the traffic load warrants. TWX (commercial) is still used where NTX coverage is not justified. The NTX and TWX systems link district and sea frontier headquarters, naval bases, ordnance plants, manufacturers, supply depots, and the countless other naval shore establishments which supply and maintain the fleet. WAVES in mock-up control tower during familiarization course which is given at the "Airman School"
Navy Radioteletype, which applies the teletype to radio transmission and reception, is given the abbreviated title RATT. Prior to the development of RATT, teletype needed wire to connect it with communication points. Contact with ships at sea was limited to radiotelephone or radiotelegraph. At the present time, many warships have radio teletype equipment; in the future, radioteletype will handle the bulk of communication traffic for all ships in the Navy. A milestone in the history of radioteletype is the sending of messages to and from aircraft in flight. This was made possible by development of smaller and lighter equipment. Radioteletype is simply an ordinary teletypewriter installation connected by means of a converter to the radio transmitting and receiving equipment. When receiving, the converter changes radio impulses into a form of electrical energy which actuates the teletype. When transmitting, the procedure is reversed. Teletype is so flexible that wire and radio systems can be combined as desired. This makes it possible for Naval Communications to span great areas of the globe with a network using Teletype alone. Although radioteletype and radiotelegraph are the primary radio systems used in the Navy for long-distance work and for recorded communications, radiotelephone, or voice radio, is also extensively used. Its important advantages are speed and ease of operation and adaptability to lightweight portable equipment. Voice radio is particularly valuable for comparatively short-range communication by aircraft and surface ships. When a number of ships are in company and time is a primary consideration, voice radio often steps in to replace visual methods. It is used for walkie-talkie, for communications between aircraft units, and in control tower operations. Ship-to-shore as well as tactical ship-to-ship communications are greatly aided by its use. Small craft, such as district craft, depend entirely on radiotelephone for radio communication. Facsimile, or radiophoto, performs the transmission of pictorial or graphic information by wire or radio and reproduction of the material in its original form at the receiving station. Navy radiophoto facilities, operating as a function of the Naval Communication Service, are maintained at Washing­ton, San Francisco, Pearl Harbor, and Guam. A basic operation of these units is the daily exchange of weather maps. They also provide a rapid method of delivering photographs, blueprints, and other material not suitable for transmission by other standard means of communication. The Navy is a participant in the joint national facsimile weather map network, which covers the entire United States and connects major air stations and weather centrals. This network is composed of facilities of the U. S. Air Force, Navy, Weather Bureau, and a few commercial stations. Mobile radiophoto units provide for operation aboard ship or at outlying points, as necessary to meet special requirements. Radiophoto transmission is an important supplement to rapid communications, providing a previously unavailable method of handling pictorial-graphic intelligence. In comparing radiophoto with other advanced communication systems, radioteletype may be likened to typewriting, radiophoto to the printing press, and television to the motion picture. It is clear from the preceding discussion that Naval Communications provides all types of facilities, from the most simple to the highly complex. These versatile facilities enable local commands to carry out in the most efficient manner whatever is the. job of the moment. In any military organization, however, there must be overall control and a means for getting the word to all elements of the forces wherever located. Effective control of our widespread naval forces is made possible by the Navy Communication System, which is an integrated network providing basic communication coverage on a worldwide scale. The chief components of the Navy Communication System ashore are the Primary Communication Centers at Washington, San Francisco, Honolulu, Balboa, and Guam. These are the "big five" of the system. The key station of the entire Navy Communication System is, of course, Washington. From this point, radio circuits and landlines tie together the entire Navy, making it possible for the fleet to perform its tasks as a single unit. From the radio standpoint, "Radio Washington" consists of several elements: a central communication office located in the Navy Department; a high power transmitting station at Annapolis, Maryland; a receiving and monitoring station at Cheltenham, Maryland; and a radio link transmitter and receiver station at Arlington, Virginia. 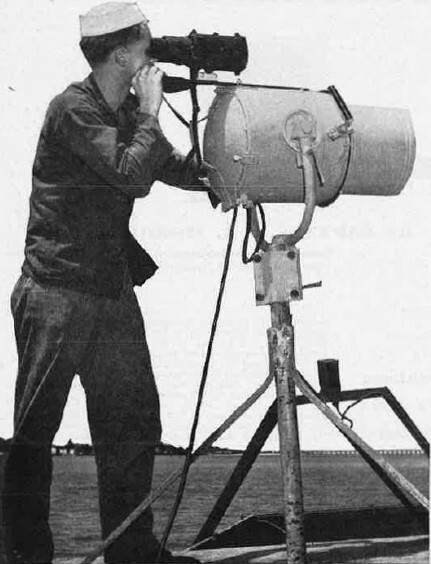 A Navy signalman uses one of the Service's signal searchlights to maintain communications during "radio silence." To get messages to all units of the Navy, a system of "broadcasts" is used. 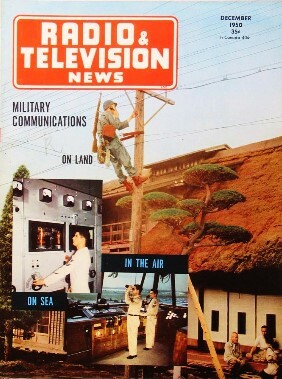 The word "broadcast" was introduced to communications by the Navy. This term is appropriate because messages are cast in all directions. Fleet Broadcast schedules are the primary means of delivering traffic to the fleet. The five major stations transmit by this method on predesignated frequencies and schedules, appropriate to reach all points. Messages normally are transmitted "blind," that is, the ships do not use their transmitters to acknowledge receipt of the traffic. This insures security and safety, since any "enemy" is deprived of the opportunity to use direction finding equipment in detecting the location of fleet units. In addition to the primary broadcasts, which require very high power equipment, secondary stations are set up at appropriate points to provide local coverage for small units operating in a local area. In addition to these two types of broadcasts, there are a number of local, low-power transmitting facilities operated in various areas to disseminate hydrographic and weather information, and time signals. Earlier descriptions of the Navy's vast teletype and radioteletype point-to-point circuits told how continental shore stations are linked to overseas points and to ships at sea. This comprehensive high-speed system handles huge volumes of traffic. Manual radiotelegraph also is used by ships to contact shore stations, when other facilities are not available. The efficient and smooth operation of Naval Communications requires careful planning. Ashore, each Naval District has its own communication organization, supervised by the District Communication Officer. This officer draws up a communication plan that provides for complete communications with ships, aircraft, and all naval stations within his district. This plan also furnishes direct channels to the Navy Department, to other Naval Districts, and to the communication facilities of other military services. District plans take special note of measures to be taken in case of local emergencies, such as storms, floods, fires, and hurricanes, when normal communication circuits may be disrupted. Emergency planning makes particular provision for the utilization of the extensive Naval Reserve Communication System. There are over 850 radio stations located at Naval Reserve activities throughout the United States. Established primarily for the training of communications personnel, and located in practically every major city and in hundreds of small communities, these stations constitute a valuable communication potential in emergencies. The seagoing counterpart of District Communication Plans are Fleet Communication Plans. These plans prescribe radio and visual procedures to be used by ships, and are drawn up to meet any situations that may arise. To achieve better service, preparedness, and greater economy, Naval Communications planning involves full coordination with the Army and the Air Force. Joint use of facilities, whenever practicable, results in economy of men, material, and radio frequencies. Employment of standard operative procedures and equipment by the three services, further assists continuing efforts toward maximum integration of military communications. 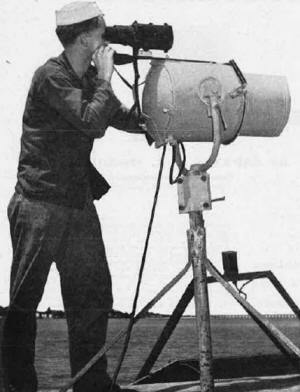 A different form of searchlight which utilizes an infrared filter and a specially designed infrared viewer. A close parallel can be drawn between the communication service required to support the operations of naval aircraft and that required by surface craft operations. In addition to the communication channels of tactical command, point-to-point flight operations require continuous circuits, fixed or mobile, between the point of departure and destination; continuous air-surface communication enroute; and reliable aids to navigation. Similar functional communications apply to ships and aircraft, since both are mobile naval units with responsibility to operational commanders, with comparable ranges of operation, and need for full operating area coverage. Both have need for fixed circuits to provide command and supporting functions. Air-ground channels parallel ship-shore channel functions, with added air-surface ship channels being provided in the case of air operations with the fleet. Worthy of note is the mutual interdependence between installations provided for communication and for navigational purposes, voice transmissions being normally made over most radio aids to navigation, and normal radio channels being used on occasion for direction-finding pur­poses. The preponderance of aeronautical communication is accomplished by voice radio, operated by the pilot, except when planes are at such distances from base as to necessitate radiotelegraph transmissions. Flashing light signals are useful between aircraft and surface craft under conditions where the use of radio is undesirable or impossible. No matter how excellent the communication system, its effectiveness is no greater than the people who man it. That is why, in Naval Communications as in every other field, personnel is the most important factor. The Navy, in maintaining its Naval Communication Service, has a continuing need for both operational and technical personnel. The manual radiotelegraph operator, the wireline expert, the electronics technician, each finds an important job awaiting him. In the past twenty years, tremendous strides have been made in the technological fields of communications. With faster ships, faster airplanes, and increased tempo in all fields, no communications organization can rest on its laurels. Continuing research has a prime objective of devising faster and more reliable means of communications. Naval Communications in the future, as in the past, will be quick to recognize new systems and techniques and to apply them wherever feasible, at all times working toward more reliable, secure, rapid and flexible communications. the electronic "nerve center" of anti-submarine blimp.